From our Missouri River basecamp, anglers fishing with the Montana Angling Company and our Missouri River fly fishing guides in 2019 will experience the ultimate fly fishing trip. Our Missouri River basecamp program centers around the world-class fly fishing on the tailwater stretch of the Missouri River near Craig, MT but also offers access to other nearby blue ribbon rivers and streams. New for 2019 will be guided fly fishing trips to the Big Blackfoot River and the Land of the Giants stretch of the Missouri River. Both of these fisheries offer great fly fishing in an incredible setting, and are great additions to any Missouri River fly fishing trip. Prime time dates from May 1-July 15 are booking fast. Anglers fly fishing in Bozeman, MT will consider a trip to our Missouri River basecamp a great addition to any multi-day fly fishing trip. Float fishing trips on the Missouri River and surrounding waters are the cornerstone of our Missouri River Basecamp fly fishing program. The Missouri River is big, broad, and deep. Perfectly suited for drift boat fly fishing. Nearby freestones are fast and rugged, making wading difficult and rafts mandatory. Our Missouri River fly fishing guides utilize both high-end drift boats and rafts to give our anglers access to all of these blue ribbon waters. We are proud to offer our anglers unmatched diversity on their Missouri River fly fishing trips. The “Land of Giants” or LOG stretch of the Missouri River runs between Hauser Dam and Holter Lake and offers consistent fly fishing in a river-like environment for trophy trout. 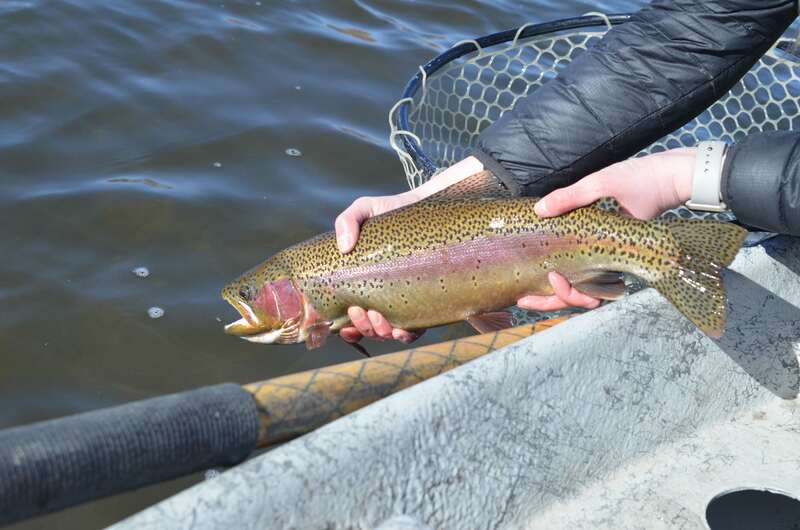 The rainbow trout and brown trout found on this stretch of the Missouri River average 20+ inches and anglers can expect catch rates comparable to those found downstream below Holter Dam. This is real deal fly fishing for big trout. USCG licensed guides are able to operate jet boats on this stretch of river to get anglers into the action. Availability is limited for these trips as these guides are in high demand, and anglers should book at least 6 months in advanced for best availability.